I'd been searching for the perfect floor lamp for a while. Something metallic with a classic shape. After a couple of months of research, I settled on this curved copper floor lamp from Marks and Spencer. I ordered it online and it had to be assembled a home, but that was pretty easy and I had it done in about 15 minutes. The lamp is great, it's curved arm and round shade has a classic Arco lamp feel about it. The copper is lush and the heavy circular marble base is beautiful and veined in very light grey. For the price, it is quite impressive and substantial. It's practical too, the curved arm can be lifted to a height of 179cm and swings round to wherever you may need it to be. There is also a stylish little lever that adjusts the round shade easily - I love little details like that - it makes a piece functional and beautiful. Copper is quite a versatile metal, it goes with surprisingly many schemes, I love using natural materials, so copper fits in very well with my style. 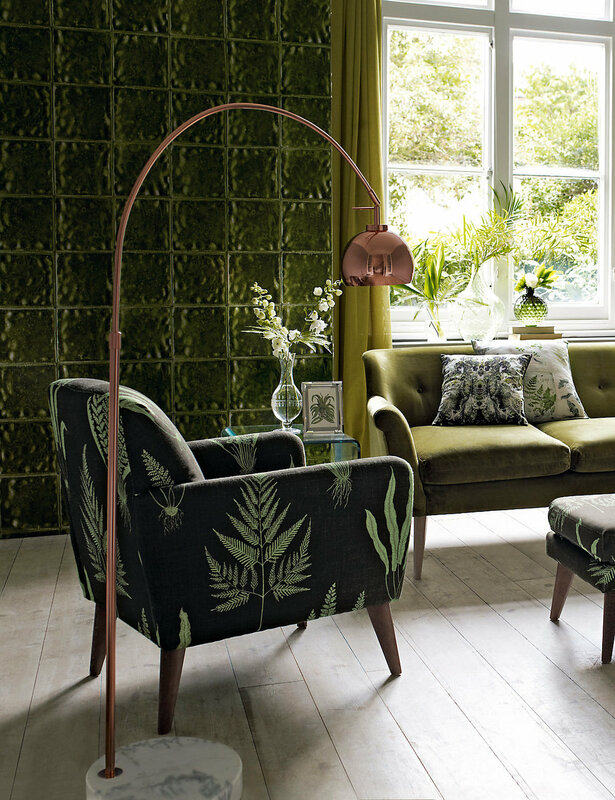 Here's how M&S styled their copper floor lamp: they've worked the botanical look, I think that green velvet sofa looks fab next to the copper.